It’s probably just that I’m a weirdo, but the bane of my life is that I spend most of it facing directly towards my desktop computer, which is nowhere near in proximity to either my lovely GoldenEar Triton One loudspeakers or my lovely Martin Logan Purity loudspeakers. To be honest, I’d rather listen to my main speakers when I’m sitting in the sweet spot on a comfy chair (preferably with a cold ale or a smooth pinot noir to keep me company), and pretty much doing nothing except letting the sounds soak into the fibre of my being. The sound from either of my main speakers, even if it was somehow magically coming at me from across my desktop, would be rather overpowered and overwhelming. But still, I spend most of the day at the desk in front of my computer, and all I’ve got is a pair of tiny, 20-year-old TDK desktop speakers that make a good fist of rendering every musical colour into variations of beige. They’re great wee speakers for what they are and they’ve lasted the distance. The bass module is surprisingly robust, but there’s a huge gap somewhere in the midrange, and while they sound okay in terms of stereo imaging, they’re hardly detailed or dynamic. So when I saw the press release for Edifier’s Exclaim Connect PC speakers, and the very modest price, I just had to audition a pair of the little suckers. Although hardly what we know as ‘audiophile’, Edifier is a well-thought-of speaker brand that’s perhaps best-known for its hardy gaming speakers. Having said that, Witchdoctor guru Ashley Kramer recently gave an almost perfect rating to the Edifier R2000DB powered bookshelf speakers. Edifier claims that the Exclaim Connect will enflame the passions of music fans and gamers alike with its ‘vivid treble and deep bass’, explaining that ‘each satellite houses three active drivers and two passive radiators which maximise audio performance. The upper section of each satellite contains two 1-and-a-half-inch midrange tweeters and 1-and-a-half by 3-inch passive radiators, while the bass section contains a 3-inch woofer and a 3-inch passive bass radiator for rich, powerful bass.’ The company cites its DSP and DRC (Dynamic Range Compensation) technology as saviours that make it possible for listeners to blast themselves with genuine volume without experiencing distortion. Which all sounds grand on paper, but I found that there were flaws that rather put a dampener on my enjoyment of the Exclaim Connect. The speakers were certainly easy to plug in and ramp up, and I was away laughing within seconds. The cords are rubbery and thick which tends to leave a sprawl of thick black spaghetti worming itself around the back of your desk, and the right-hand speaker has no less than three cords to plug into it (power cord, interconnect to the other speaker, and cord to the computer) but I guess this can’t be helped. That’s one thing I liked about my TDK: the bass/powered unit was separate to the two satellites and I could place it under the desk and out of the way. The on/off button is on the left bottom of the the right-hand speaker (this doubles as the Bluetooth setting, with the light on the front cleverly changing from red to blue right on cue) with volume up and volume down buttons directly above it. Speaking of which, their Bluetooth capability certainly make the Edifier Connect a versatile speaker, and I found that playing music from my iPhone was so simple that even my 3-year-old could have figured it out. So far so good. But what of Edifier’s claims? Well, first of all the Exclaim Connect does indeed sound very nice. While it would be ridiculous to expect a sub-$200 speaker to give a full spectrum performance, the tops and mids at least are sweet and relatively detailed. 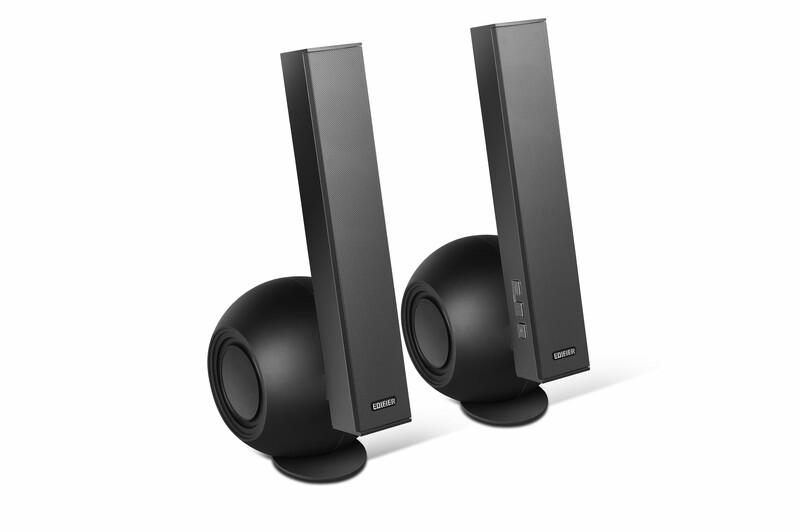 PC speakers are designed to be listened to in a near-field situation, and in that respect are similar to studio monitors. 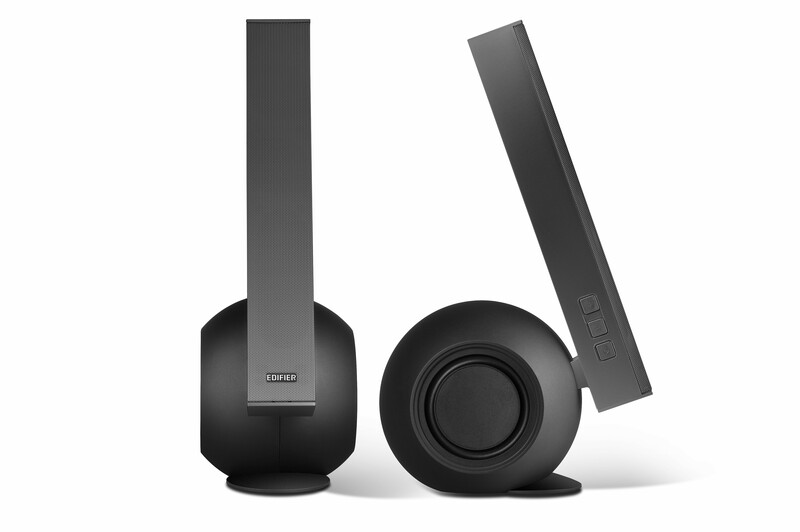 More so than many desktop speakers, the Edifier’s beamed out a perfect sweet spot. When I had to get out of my seat and shoot across the other side of the room, the dissipation of sound was instant. Now, that’s a good thing in my book, because while you’re in your seat at the desk, if the sound is any good it should be like a musical forcefield that you’re perfectly placed within. That the magic is lost when you move out of that forcefield means that the sonic picture is working as it should. So the sound is good, but how good? Well, not audiophile good, but remarkably close, given just how crappy most nicely priced desktop speakers sound. I could happily live with this sound, and would even consider buying a pair, except for what to me is a dealbreaker. You know that claim above that the speakers can go really loud, with no distortion? Well, I must confess that I like a bit of loud, but I would never really punish a small desktop speaker. Still, I found that even at the moderate volumes I pumped out my tunes there were some very real qualms. The speakers sit on a small platform under which is some soft gauze-type material which I’d guess is what they’ve come up with to minimise vibrations, but it simply doesn’t work. I found that whenever I pumped up the volume a little on even tunes that were a bit bass-heavy, there was an audible vibration between the platform and the desk. It’s true that if I’d bothered to try various dampening solutions this problem may (or may not) have been averted, but it seems rather troubling to me that there’s so much vibration at the foot of these speakers. I’m not surprised, however, because the platform is directly under the bass module. The other thing is that, well… the DSP and the DRC may work against any perception of distortion, but I found that when playing bass-heavy music, the speakers just didn’t cut it. They were absolutely fine on music where most of the information is in the mids to highs, but especially when encountering the deep bass of electronic music (I’m thinking groups like Monolake or Pitch Black) the poor little bass radiator and speaker both looked like were about to pop their sockets, and the sound was pinched and unconvincing. Whenever I played music with deep bass on these speakers, I found myself turning them down to a volume so low that I couldn’t really enjoy the music, simply because I felt that the speakers couldn’t handle the frequencies. 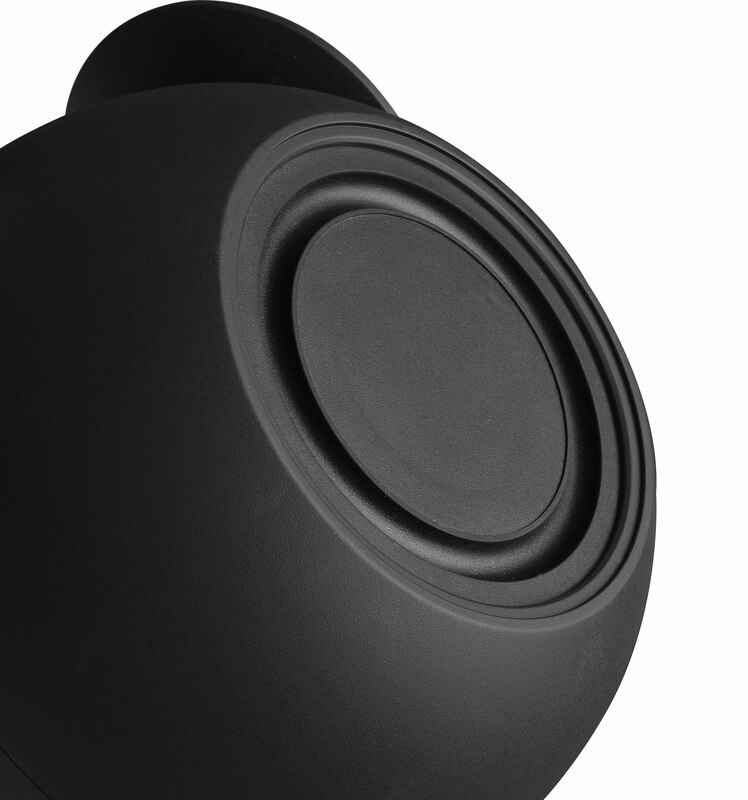 Don’t get me wrong: I’m not expecting sub-bass from a pair of modest desktop speakers. It’s just that when confronted with the same music, my ancient TDK desktop speakers would simply obliterate the deep tones and play what it could handle with aplomb, and there would be no sense of struggle. So there you have it. 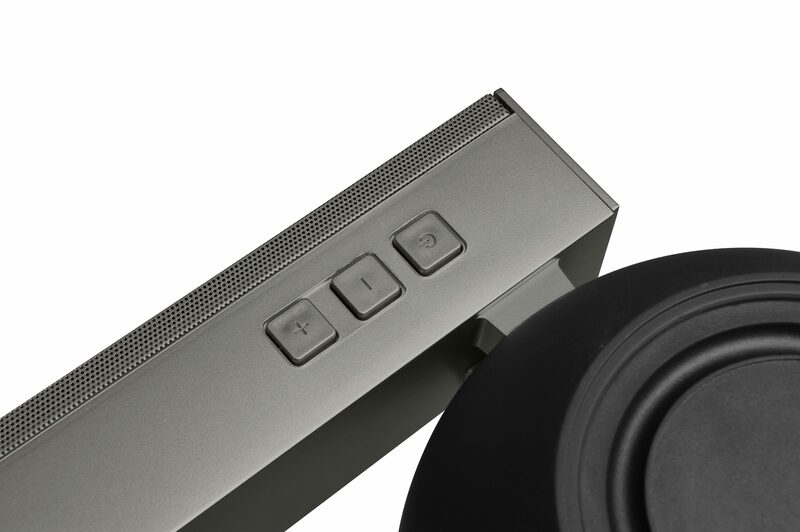 Edifier’s Exclaim Connect is well worth the investment for those who play mostly light rock or classical or jazz or music without too much bass, and who don’t like pumping up the volume. And maybe the sound could be further improved by using one of those snazzy little DACs that are so popular. But the sound on the right music is already quite remarkable for the price, whether it’s from files on the hard drive or a streaming service or via Bluetooth on your mobile. It’s a very specific demographic that will like these speakers, however, and I really doubt Edifier’s claims that gamers – with all their gunfire and sonic booms – will find them to be of much use.